Our Dural Sliding Door Repairs are Quick & Easy. 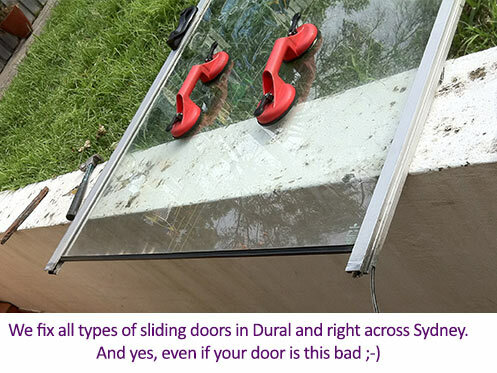 Adsafe Doors has been servicing the Dural area with sliding door repairs for over 20 years and have hundreds of satisfied customers from Arcadia to Fiddletown and all the way over to Berowra Heights. then we have a cost-effective solution perfect for your situation. Our history in the Dural Area is extensive and we have been operating in the area since 1992 and all our work is quality guaranteed. We only use premium products and promise that once we have finished working on your door, you will be able to open and close it with one finger. We have been perfecting our sliding door repair process for over 20 years and we find the combination of experience, quality materials and professionalism allow the best result for your sliding doors repairs. Click play on the video below to see the process we go to get your door sliding like new again. the roller simply disintegrates or creates rough edges and becomes near impossible to move. You will notice the image on the right with only one fragment of the roller left. Your sliding doors are likely at this stage already, so give us a call today and we’ll arrange a time to fix your door and get things back to normal. To understand our process in more detail, watch the video below. Here we are fixing a client’s door from start to finish. You will notice how near impossible the door was to begin with, as it had disintegrated tracks and the rollers. Tracks and rollers are the two biggest issues when it comes to sliding door repairs. We see it all the time. This particular job was done at West Pennant Hills and if you watch the video to the end you will see how the locks line up perfectly and how easy it is to open and close the door. Give the Adsafe Doors team a call today on 0417 464 743. We’d love to hear what issues you are having with your sliding door so we can recommend the best solution at the right price. I have this old aluminium sliding glass door. After years of repairs and never lasted long. Today I called around 4 companies, no-one was helpful. One company stated minimum $4,200 + per job or above if I accept they would send a person to come and measure. I finally got to Stephen on my 5th call, he took the time to understand my situation and given me options to considered. He suggested instead of replacing the whole door and glass unit, let's see if he could fix it instead. Stephen came as he promised and he fixed my door beautifully with absolute pride in his work. The best of it - the cost only a fraction of what others company have quoted me. THANK YOU Stephen and Jessie. We are so pleased with the repair done by Stephen to our sliding door. It would barely move before (and wouldn't lock) and was hanging lopsided, to now sliding perfectly. So pleased with this service. It is better than ever. The whole service from the first phone call where Stephen recommended ways to secure our place until he could repair the door to cleaning up properly before leaving was exceptional. We highly recommend Adsafe. I had a sliding door that refused to slide and a sliding security door that constantly came off its track. 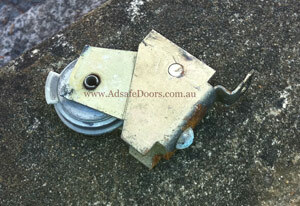 Stephen from Adsafe came out, fixed both doors and charged less than the original quote! I now have two doors that slide easily and a security door that provides security! Not only was the work completed quickly and professionally, but Stephen also rang to advise me that he was going to be a little later than the agreed time, due to traffic. Thanks for the excellent job and professional service.